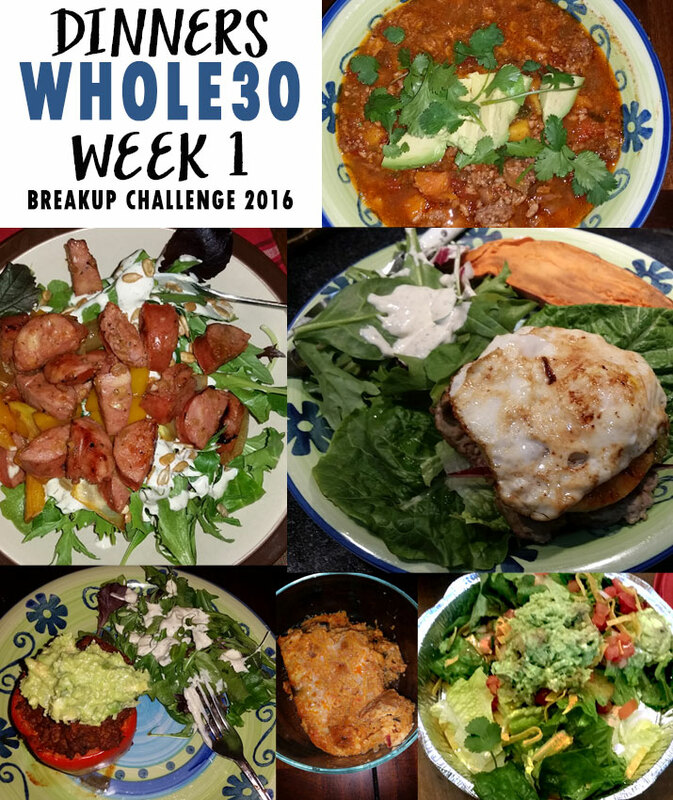 Happy week 2 of the Breakup Challenge! If you are just joining us, Amy and I decided that 2016 would be the year we broke up with our bad habits, and were asking anyone and everyone in the blog world (or otherwise) to join in! Whether you pick one habit to focus on or kick for the 30 days, or join us for Whole30, we're all in it together! I am happy to report that this week I am starting to feel the positive effects of Whole30. The first week was hard. Not so much in cravings or what to eat, but in that my body was detoxing itself and exhausted without it's usual source of sugary, carb loaded energy. The adjustment takes a while and I knew to expect those effects, but still it didn't make it any less hard. This week so far the exhaustion is gone at least and I even got a "you look like you've lost some weight" from the BF! Since you can't weigh or measure yourself during Whole30, I'll take that as a good sign! But enough about how I've been feeling, and onto the goods. I know you want to see the FOOD! Here's the thing, as restrictive as Whole30 sounds, there is still a ton of amazing food you can eat. I never felt like I was missing out this week - other than when I had to go to my favorite tap house for a birthday party and NOT have a beer. 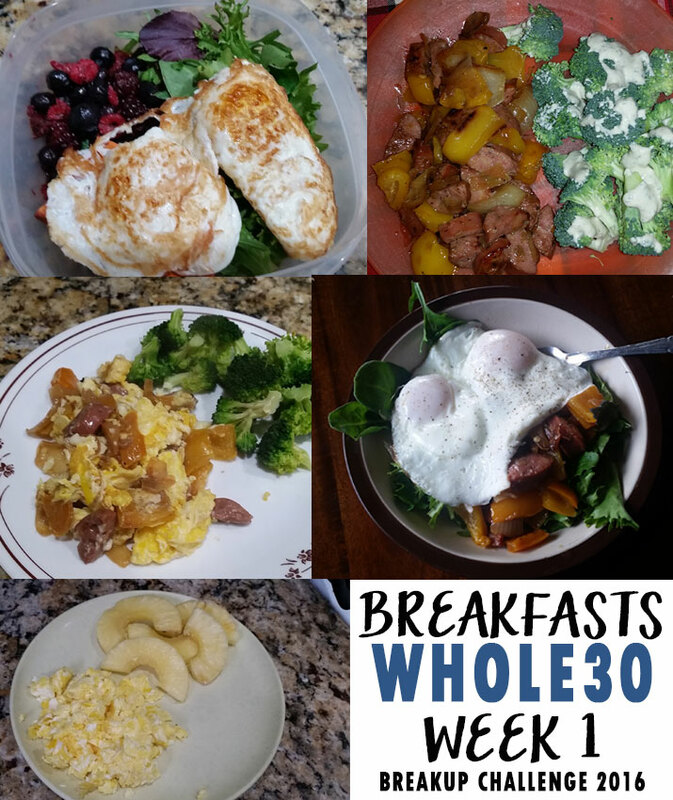 During my last Whole30 I listed out every day's worth of food. This time I'm going to shorten that up and just list it as breakfasts, lunches, dinners and snacks. If there's fewer in that category, it means I had some of those items multiple times. Breakfasts: fried eggs over 1/4 sweet potato and greens, with berries | leftover sausage and pepper stir fry scrambled with eggs with a veggie (broccoli or carrots) | leftover sausage and pepper stir fry with fried eggs over greens | scrambled eggs with side of pineapple. 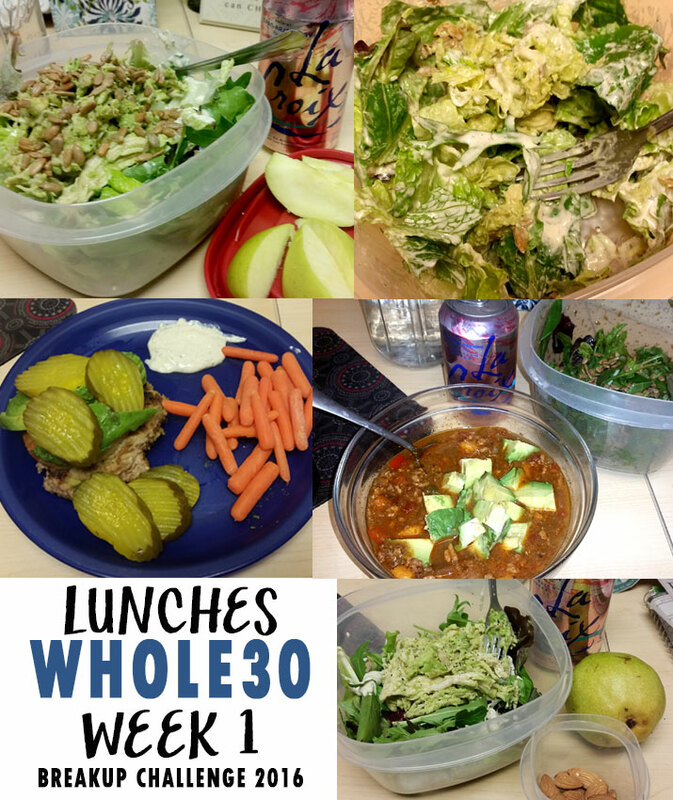 Lunches: shredded chicken, mashed with half an avocado over greens with Whole30 ranch and a side of fruit and La Croix | leftover turkey burger topped with grilled pineapple, avocado and pickles with baby carrots and ranch | leftover Paleo jalapeno popper chili and side salad with balsamic. Dinners: Paleo jalapeno popper chili with avocado and cilantro | chicken apple sausages stirfried with bell peppers and onions over salad | avocado turkey burger topped with grilled pineapple, pickles, onion and fried egg over lettuce with sweet potato and salad | stuffed bell peppers with homemade guacamole and side salad | Cafe Rio (to go) grilled chicken salad, no shell, beans, rice but with double meat and pico and homemade dressing | leftover pepper stuffing meat over salad | Paleo pizza pie and side salad. Going into week 2 I know it's key to plan ahead. As a treat to myself for doing Whole30 I purchased this meal planning pad that goes on the fridge. It's much cuter and more organized than the notebook I was using. I planned all our dinners and went grocery shopping, hard boiled some eggs and cooked a couple sweet potatoes for breakfast to get ready for the week. I'm heading into this week rejuvenated and ready to roll. I look forward to how this week will go with the challenge, as well as some major life things that I can't talk about just yet. Overall I finally feel I'm on my way to thriving this year. And it feels great! 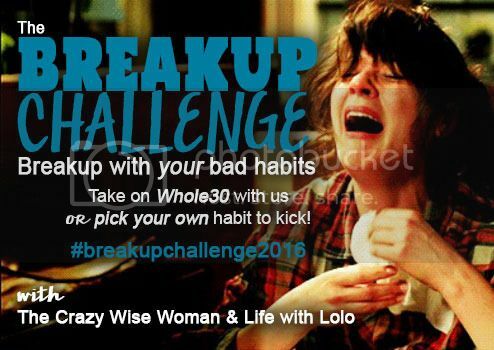 Are you taking part in the Breakup Challenge? 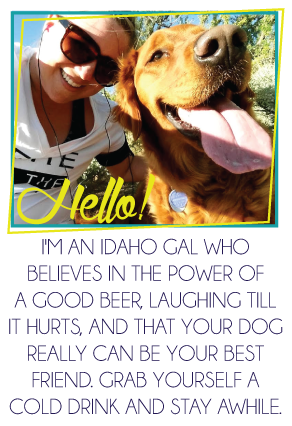 Don't forget to link up with Amy @ The Crazy Wise Woman or me! love it!!!! when you fill your body with healthy, fresh foods you feel so incredible and full of energy. while i loathe meal planning/prep, i know i have to do it and when i'm pressed for time, i start to panic because i'm all OMG WHAT AM I GOING TO EAT?!?!?!? i'm so conditioned to plan ahead with my food that i'm always thinking a few days ahead. Keep at it, lady! You are rocking it out and the hard week is behind you. Your mind set is 100% right, plan, plan, plan, that is the key to success. I suggest eating a LOT before the work party and sneaking a Lara or Naked bar in your purse in case you are tempted. Your meals look delicious, saving this post for some healthy new eats. So I did a juice cleanse for 3 days and at first I was like, "Wahhh I need to actually chew something," and then at the halfway mark I was like, "Whoa, I'm so energized, I have so much room for activities!" I'm glad you're at the energized stage. That's that fun part. Omg your food looks so amazing! I need to make the chili and the pizza pie next week for sure! !kepp on rocking it, we are almost 1/3 of the way done... that went fast! But on the other hand Feb. 3rd seems like next year. I am feeling pretty amazing too! Dang! Good for you, Laura! I just said I would (try to) break the habit of biting my nails... and I'm failing miserably! You're doing so well!! yay you go girl! 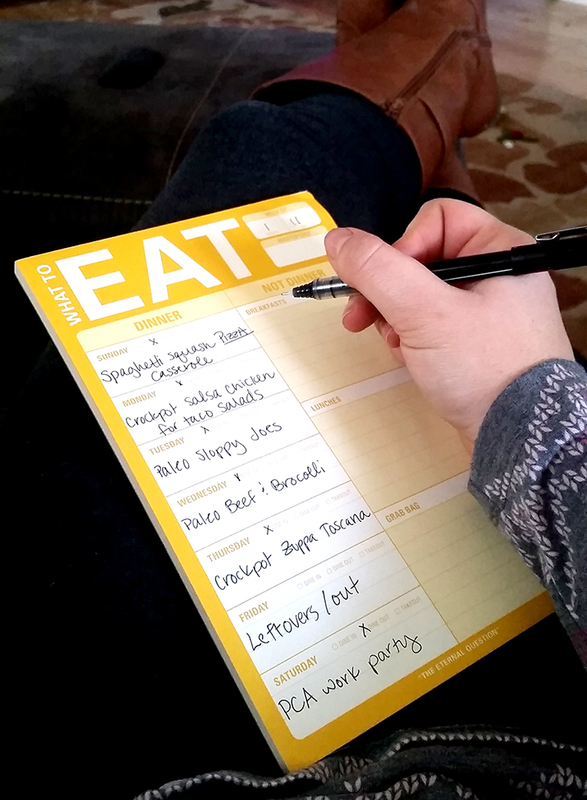 love that meal planning pad, need it in my life. all the food looks super good, i'll have to check out some of those recipes and the whole30 ranch sounds interesting. i'm not doing the whole30 with you all, but i have given up soda - 12 days going strong! Hey! I'm making salsa chicken in the crockpot tomorrow with a side of Spanish rice. That chili is so amazing!!! I made it last night and I am in love and had it again for lunch today. I am making the pizza pie later this week too! I am so passionate about this that I convinced one of my coworkers to join in! He started today since he wanted to wait til after the championship game last night. I shared my grocery list with him on Grocery IQ and he is eating all the same things as me. The more people I can turn the easier it is for me! LOL! PS I feel amazing today! You and Nadine are making me want to try thissssss!!! I know I could do this... aside from the booze. We eat pretty healthy (aside from going out maybe once a week) but. The beer. The wine. The bourbon. I drink more this time of year and almost always want a hot toddy when it's super cold! I'm going to try some of these recipes! You're rocking it! Awesome, thank you for talking about everything that you CAN eat. I love the meal planner and that you boldly underlined PIZZA :) I still feel for you though on the tap house birthday. I love that meal planning notepad! I'm jealous of all of the variety of meals you get to eat in a week. Even though I've been out on my own for going on 2 years now I haven't mastered the cooking for one thing. I usually make one thing and eat it for days which isn't bad but sometimes it's just not what I'm feeling at every meal. Learning how to adapt recipes for one person to eat just once or twice is something I think I need to add to my 2016 goal list!